On September 20th, Attorney General Bob Ferguson announced a lawsuit against the GEO Group, the second-largest private prison provider in the country, which operates the Northwest Detention Center. The state’s lawsuit asks the court to order the company to give up the profits netted from paying detainees up to one dollar a day for their work in the detention center. 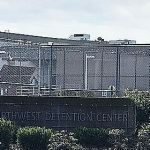 KBCS’s Yuko Kodama caught Maru Mora Villalpando, community organizer of Northwest Detention Center Resistance, on the phone to talk about the conditions regarding work inside the Northwest Detention Center, for its detainees.